On the second of August 2008, the title of an opinion article in the Jerusalem Post caught my interest. Titled “The ‘Economist’ Rewrites History” by Zalman Shoval, former Israeli ambassador to the United States it accuses The Economist of revisionism only because it positively reviewed, under the Arts section, a book called Palestinian Walks, Notes on a Vanishing Landscape, written by Raja Shehadeh, a Palestinian Lawyer and founder of Al Haq* organization in 1979. 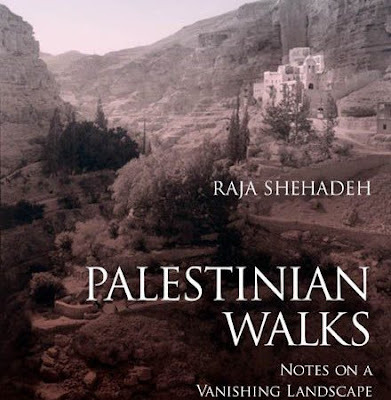 In his book, winner of the Orwell Prize 2008, Shehadeh describes the change in the landscape of the hills surrounding Ramallah through seven walks he took in the area. His lyrical description of the “Biblical Hills” comes as a perfect justification of the prize awarded to the author and his book. The seven walks counted were not made within a year or two; they are spread at least over two decades. That’s exactly why the reader, while turning the pages of this book, is taken through the geographical changes to the hills and their surroundings over a troubled time, where political and military events had the strongest impact on transforming the peaceful nature of what Shehadeh calls the “Highland Hills of Palestine”. Shehadeh’s perspective is also interesting in the way he shows how the function of the hills surrounding Ramallah changed over the generations. From a place where Palestinian men used to escape the hot summers, working the land and building Qasr (round stones structures built without concrete dotting the land where farmers kept their produce and slept on the open roof), the hills now fulfill a security function, but this time for the Israeli settlers building outposts to better control Palestinian areas. Shehade’s journey and description of this change of function intersects with the Israeli architect Eyal Weizeman’s thesis called "The Politics of Verticality", where the latter develops the idea that the Israeli architecture has played an important role in the conflict for the past six decades. Weizeman’s more recent work has focused on the way the Israeli outposts are built in a South African “apartheid” style. Shehade’s book is Art, contrary to what his Excellency the ambassador pretends. How can art not relate to politics in that part of the world where the historical artistic patrimony is transformed daily by political conditions? In that specific sense the book is politically potent. Even if its formal relation to the political sphere is subtle, using hints and questions that push the reader to seek political answers elsewhere. This last argument is probably one of the reasons why Shehade was awarded the Orwell prize. He doesn’t impose political conclusions nor affirms ideological positions. A fact he comes across as a very harsh critic of all Palestinian factions and militias, simply by counting the number of times he came close to being shot dead by armed Palestinian militants on his walks, or the abuse he suffered, he who founded an organization to protect Palestinian rights, at the hands of those who pretended to protect him. In its review to Shehade’s work, The New York Times Book Review found that: “Few Palestinians have opened their minds with such frankness”. Such acclaim disqualifies totally Shoval who showed nothing but hatred and racism in his judgmental article published in the Jerusalem Post. Nowhere was that more obvious than in the disdain he showed “a certain Raja Shehade, portrayed as a lawyer and a writer…” As if he, a government official, did not know that Shehade is well known to Israeli tribunals as a lawyer who defended the Palestinians against land expropriation practiced by Israel. Shoval’s position is in fact against anyone who dares looking at the Israeli – Palestinian conflict from an angle that questions long-established Zionist myths. That is why he accused The Economist of re-writing History. His Excellency knows well enough that if this book achieved fame, it is because Shehade does not play political games. Instead, as an experienced professional lawyer, sticks to the hard facts. A concept that the seasoned diplomat obviously struggles with. *Al-Haq is the West Bank affiliate of the International Commission of Jurists - Geneva, and is a member of the Euro-Mediterranean Human Rights Network (EMHRN), the World Organisation Against Torture (OMCT), the International Federation for Human Rights (FIDH), Habitat International Coalition (HIC), and the Palestinian NGO Network (PNGO).